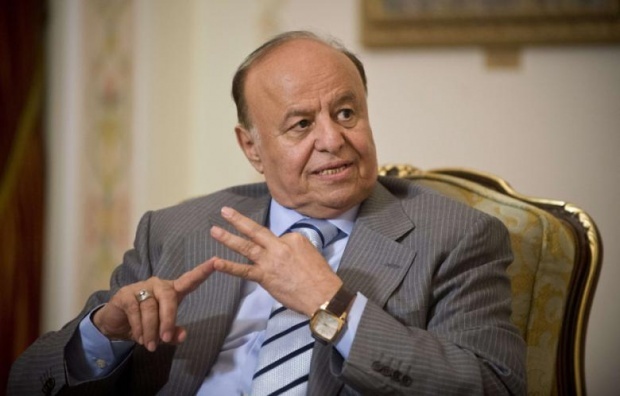 Jeddah, London- Yemeni President Abd Rabbuh Mansour Hadi has totally rejected the so-called “transitional political council of the south” to administer and represent the region, asserting that such behaviors and actions totally contradict the three references based on the Gulf initiative, outcomes of Yemeni national dialogue and UN resolution 2216. A statement issued Thursday following a special meeting between Hadi and his advisors, announced that all officials and other parties whose names were mentioned in the council should announce their clear positions from the new declaration. The statement also considered the “transitional political council of the south” as only benefiting insurgents and those who support them. The meeting, presided over by Hadi, was attended by Yemeni Vice-President Lt. General Ali Mohsen Saleh and Prime Minister Ahmed Obeid bin Daghr. On Thursday, former governor of Aden Aidaroos al-Zubaidi said that senior tribal, military and political leaders have formed a new council seeking the secession of southern Yemen. Zubaidi said a “national political leadership” under his presidency would administer and represent the south. Separately, a source at the office of UN Special Envoy to Yemen Ismail Ould Cheikh Ahmed said that the envoy had presented new proposals to solve the Yemeni crisis during five meetings held in Riyadh. The source told Asharq Al-Awsat that the issue of al-Hodeidah is now part of the UN’s security plan on Yemen. “In the new proposals, the UN envoy plans to reach a comprehensive and peaceful solution in Yemen,” the source said.